As a kid, I religiously watched reruns of Gerry & Sylvia Anderson's television show Thunderbirds. Perhaps I am a bit blinded by childhood memories of Thunderbird toys and such, but I still think this series is one of the best things ever put on television, especially in terms of programming for kids. Without the excessive violence or vapid plots we usually see nowadays, the show managed to pack fairly intelligent stories with good excitement, action, and an astonishing attention to detail and quality. Of course, the first thing you'll notice about the show is that every character is a marionette. Do not panic! Do not assume you've lost your grasp on reality just yet. It's just "SuperMarionation!" Using this technique, the show was told entirely with puppets and small models. The Andersons had previously used this style to great effect in their popular show Stingray, but Thunderbirds increased the epic scale of the work at least twofold. For those of you who never experienced the show (or forget what it was all about), Thunderbirds is set in the distant future, usually placed in the year 2065. At this time, technology around the world has advanced to the point where average citizens are interacting with more and more complex forms of convenience and travel. Of course, this means a new realm of accidents and trouble spots. So, the secretive organization known as "International Rescue" is formed, designed to intervene when people are in trouble and in need of help. Operated covertly by the Tracy family (John, Gordon, Jeff, Virgil, Scott and Alan), specialists in piloting and technology who call themselves the "Thunderbirds", with each of them piloting a unique craft. Other members include the brilliant engineer called 'Brains' and the secret agent Lady Penelope. From their spacecraft, Thunderbird 5, International Rescue monitors the Earth for any disaster or emergency that might need their super-technology, meaning each episode is like a little disaster movie. All the Thunderbirds ever ask for in payment is that the people they help never reveal their identities and try and help keep their hideout secret. Wouldn't you? Sure, it's funny watching marionettes walking around and talking, but when you take into account this was the 1960s, it doesn't really seem too wild. It's also hard to ignore the vast amount of work and technique that went into making each show. All of the aircraft, ships, sets, and props are crafted with amazing detail. So much so, that you might forget it's all done with puppets and models. (Not surprisingly, one of Thunderbirds' chief effects men was Derek Meddings, the legendary miniatures expert who worked on almost every James Bond film until his death, shortly after Goldeneye) The creativity and ingenuity of the show is something you simply don't see anymore, and Thunderbirds is pulp-fiction adventure at its best. The premiere episode begins with the infamous villain 'The Hood' desiring to know more about the technology of the mysterious International Rescue. In order to lure out IR, he plants a bomb inside a new, superfast airliner. The plane is fine if it stays airborne, but if it lands, it explodes! Forget Speed, there's no Keanu here, just the Tracy family doing what they do best! Rating: 5 out of 5 Thunderbirds. The Army is testing out a new, landwalking vehicle in the jungles of Africa. It can't be stopped...that is, until it falls into a burning sinkhole! After attempts to rescuing the crew result in several toasted soldiers, International Rescue is called. Unfortunately, this episode moves a bit slow, and takes too long to really get going. Rating: 2-and-a-half out of 5 Thunderbirds. A new super-skyscraper has been built, so huge it can hold an entire city. Things go bad, though, when a moronic driver crashes in the parking garage, causing an enormous fire to break out. The tower city is engulfed in flames and a family of three are trapped in the garage! Thunderbirds to the rescue! Rating: 3 out of 5 Thunderbirds. A mission is launched to the sun with the goal of gathering sun particles. All seems well until the rocket's controls malfunction and it heads straight into the sun. International Rescue gets involved, but will IR wind up needed their own rescue? Thunderbird 1 is forced to make a rough landing when mysterious fighters attack it over a desert expanse. Luckily, pilot Scott Tracy is aided by some travelling archaeologists searching for a legendary pyramid. Scott returns home, but the archaeologists wind up in their own trouble when they locate the mysterious pyramid, only to discover it houses some unfriendly guests! This episode begins before International Rescue exists, and The Hood is attempting to uncover the technology behind an atomic plant in Australia, but he winds up destroying it in the process. One year later, The Hood is trying to obtain information about another atomic plant, but this time he possesses a new device to help him, the "Mighty Atom"! What is the Mighty Atom? Tune in and find out. Image Transfer Review: Thunderbirds was recently remastered for the purposes of re-broadcasting on British television, as well as European DVD release. Now Region 1 users can appreciate a nice clean, clear picture for these episodes. Looking better than perhaps they ever have, the episodes lack any kind of artifacting or digital flaws. Some scenes have a great deal of damage (usually the stock footage moments), but overall the source material is good. Colors are slightly faded, but still nicely enhanced and warm, which is important given the loud color schemes of the show. Audio Transfer Review: To the best of my knowledge, producer Gerry Anderson helped create new Stereo Surround audio tracks for the Thunderbirds re-release. Along with the Dolby 2.0 versions of these soundtracks, a new Dolby 5.1 mix has been included as well. The Dolby 2.0 track is very nice, with lots of stereo effects and very broad, impressive soundstage. Dialogue is rooted in the center, but there are many directional effects and ambient usage of the surround channels. The 5.1 mix is more impressive than one might expect. The 5.1 seems a bit cleaner and louder than the 2.0. The music is significantly charged up in the 5.1, with a very auditorium-like feel. Many split-surround effects and directionality are present, as well as a heavy-duty LFE channel track that rocks the house with explosions and such. My only minor complaint is that the beefed up 5.1 sound effects are sometimes a bit too loud. The explosions tend to blow you out of your seat. The original mono is not available, but I don't think fans will complain. If the wild upgrade of the 5.1 bothers you, the 2.0 Surround is about as faithful to the original as you'll get, and it's Gerry Anderson-approved. On a side note, if you want to turn on the 5.1 via the menus, you have to go into the "Bonus Features" section. Extras Review: The picture and sound quality alone make for a nice gift to Thunderbird fans, but a few small features pepper the discs. 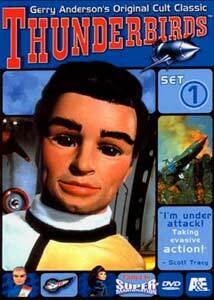 Volume 1 contains the original preview short that aired on British television before Thunderbirds debuted. It's about 4 minutes and shows a bit of the work that goes on behind the scenes, although this material is from Gerry Anderson's Stingray. Both discs have additional photo galleries containing a variety of stills from the shows included. No doubt, readers will be pleased to know that the images are full screen-sized, and not marred by menu buttons or frames. The presentation is pleasing, with nicely themed menus that change depending on the disc.